Edited by esvath at 22:16, 21 Mar 2013. I like the screenshot. Now Ubi, give me this game without bugs and with good story, and I will restore my faith to you. Reusing models in the same game isn't still making that game? Also, for all we know, the sci-fi could be a thing in the plot. We know that Ubi has at least acknowledged the Forge, even if it was just for April Fools'. Still, I am getting really tired of Ashan. I'm not going to say "planetary travel" anymore, but a bit more variety in that respect would be pleasant. Edited by Avirosb at 23:37, 21 Mar 2013. One letter away from Ashcan. Edited by Storm-Giant at 23:42, 21 Mar 2013. Won't be surprised if they scrapped it anyway. Very well could end up being disappointed, but for now I am psyched. It seems to be fantastic! Imagine all the sudden rage if they suddenly scrapped it. It's not like there aren't several nails in that coffin already. Even though i know what ubisoft has done to heroes 6 i must admit that i am very hyped for this one. 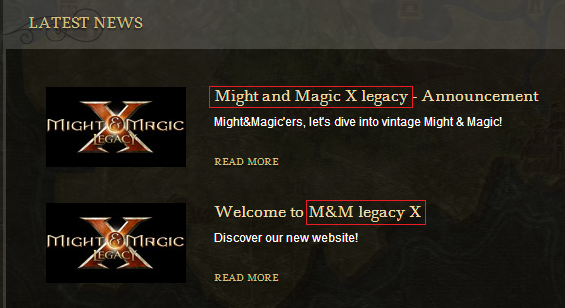 I love the might and magic games but had though they are dead. Remember, Ubi: No M&M without funny status effect portraits! Legacy refers more to the old formula, it is by no means a continuation of old storylines. Which is why I personally didn't like including the X in the title. But I suppose it does fulfill the legacy part in its own way. Edited by Storm-Giant at 14:03, 22 Mar 2013. They opened an official Forum for this game. Personally, I don't expect to be a big game like old ones. Not necessarily a bad thing, though. Better try to make a medium, more reasonable game without too much bugs and later on add expansions/sequels. Edited by Mitzah at 22:57, 22 Mar 2013. - various technical problems at launch. Don't get me wrong, I'd like to be contradicted on at least 3 accounts. Still, Ubi is Ubi. I enjoyed Grimrock very much, but I doubt M&M10 will have the same success because they've probably made compromises already.